Hi-Tec Oils Toowoomba Speedway last night played host to night one of the BK Trading Australia Easter Triple Challenge, with over thirty cars contesting the event. Robbie Farr got the win despite the efforts of Lachlan McHugh, Andrew Scheuerle and Michael Saller, with Saller home in second and Brent Kratzmann home in third after a brilliant drive in the second half of the forty-lap A-Main. Daniel Cassidy and Andrew Scheuerle rounded out the top five last night, while misfortune befell Lachlan McHugh, Peter Lack and Luke Oldfield, all three ending their night on the infield and out of contention. 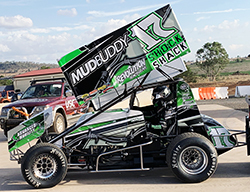 Lachlan McHugh dominated Round Fourteen of the East Coast Logistics Sprintcar Series at Ausdeck Patios and Roofing Archerfield Speedway last night, taking out Quick Time in qualifying before taking the win in the main event. Andrew Scheuerle was strong all night in the Ausdeck A1 racer and managed to secure second while Kevin Titman managed to hold off a hard-charging Michael Saller to round out the podium. Saller was forced to settle for fourth, a margin of just 0.109 between him and Titman, while Bryan Mann completed the top five. Peter Lack, who had qualified to start the A-Main from pole position, exited the race on the opening lap after contact with McHugh as they negotiated over the lead, while Luke Oldfield crashed out of the event in truly spectacular fashion five laps in, while leading the field and beginning to make his way through lapped traffic. It was a night that saw some incredible racing and several nasty crashes, including a four-car pile up at the start of the B-Main. Fortunately all drivers were able to walk away from their wrecks. 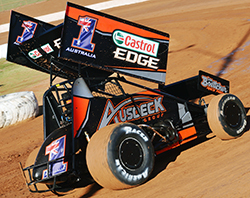 Lachlan McHugh got the win in Round Twelve of the East Coast Logistics Sprintcar Series at Ausdeck Patios and Roofing Archerfield Speedway last night after a truly breathtaking battle with Australian Sprintcar Champion Andrew Scheuerle for most of the race. Scheuerle led most of the race after starting from the front row, while McHugh quickly found his way into second and started challenging Scheuerle for control of the race. The pair switched positions several times, with McHugh persistent and unrelenting while Scheuerle refused to surrender, but with lapped traffic in play it all came undone for Scheuerle with half a dozen laps to run. McHugh was charging around the top side while Scheuerle tried to get underneath the lapped car of Andrew Corbet as they rounded three, but contact between Scheuerle and Corbet ended with Scheuerle making heavy contact with the turn three wall and Corbet up-side-down. Unfortunately neither were able to restart the event. Lachlan McHugh got the win ahead of Luke Oldfield while Kevin Titman had a great run to finish third, with Peter Lack and Ben Hilder rounding out the top five. 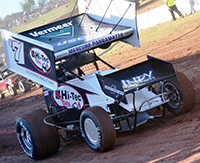 Sprintcars Queensland returned to Hi-Tec Oils Speedway in Toowoomba last night for another round of the Ultimate Speedway Challenge, yet despite the very best efforts of the entire team at the venue, Mother Nature proved unbeatable. The night saw several very light showers pass over the track and briefly pause proceedings, before a heavier and more prolonged shower began to fall just moments after the B-Main concluded. Mark Pholi and Ben Atkinson Jnr were to share the front row for the start of the A-Main, with Randy Morgan, Robbie Farr, Sam Walsh and Brent Kratzmann close behind. Luke Oldfield had exited the competition after a crash in the first round of heats, and Australian Sprintcar Champion Andrew Scheuerle was set to start deeper in the A-Main field that he is accustomed to, but it was not meant be, with Mother Nature intervening once more as another shower of light rain hit the venue. While every effort was made to be able to try and finish the program, there was more rain on the way and the team at Hi-Tec Oils Speedway were left with no other choice than to abandon the remainder of the program and allow teams and fans alike to pack up before conditions deteriorated further. Sprintcar racing does not get much better than the show the Sprintcars Queensland drivers put on at Ausdeck Patios and Roofing Archerfield Speedway last night. Round Eleven of the East Coast Logistics Sprintcars got underway with twenty-seven contenders, individual qualifying, two rounds of heats a fifteen-lap B-Main and a pair of twenty-lap A-Mains to round out the night, yet despite the format the competition at the top was fierce, with Luke Oldfield and Andrew Scheuerle dominating both feature events, taking one win and a second each and ending up tied on points at the final fall of the chequered flag. Oldfield, having won the first of the twin features, was credited with the round win, with Scheuerle officially second and Allan Woods, who finished fourth in both features, securing enough points to finish fourth. Randy Morgan had probably his best night in a Sprintcar to date, and scored two fifth place finishes in the feature events. 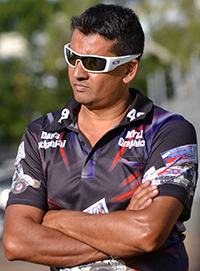 He finished fifth overall. Luke Oldfield won the first of the feature events, from Andrew Scheuerle, Brent Kratzmann, Allan Woods and Randy Morgan, and while Oldfield inverted the top ten for the start of the second event he and Scheuerle fought their way to the front, with Scheuerle taking the win in the second feature and leading Oldfield, Kevin Titman, Allan Woods and Randy Morgan across the line. 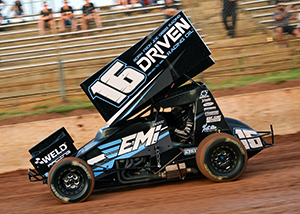 Sprintcars returned to Ausdeck Patios and Roofing Archerfield Speedway last night to resume the local East Coast Logistics Sprintcar Series, with newly crowned Australian Sprintcar Champion Andrew Scheuerle racing to victory in Round 10 last night. Brent Kratzmann was exceptionally fast during the thirty-lap affair, making his way into second, after starting fifth, and rapidly closing in on Scheuerle in lapped traffic, but was forced to settle for second at the fall of the chequered flag, while Allan Woods held off a hard-charging Peter Lack to secure the final podium position. Lack finished fourth while Andrew Corbet rounded out the top five. Luke Oldfield got the win last night in the BK Trading Australia Mayor’s Cup at Toowoomba Speedway after taking the lead from Kerry Madsen with a spectacular outside passing move just a few laps from the chequered flag. Madsen finished second while Sam Walsh got the better of Jayden Peacock late in the race to snare the final podium position. Peacock, who spent most of the race in third, crossed the line in fourth after a brilliant run in the early laps of the race to advance from seventh, with James McFadden rounding out the top five. Last night Queenslander Andrew Scheuerle got the biggest win of his twenty-five year racing career when he raced the across line and was first past the chequered flag in the 57th Australian Sprintcar Title, which was proudly sponsored by BK Trading Australia. Scheuerle, fittingly driving the Ausdeck Group and Castrol Edge Q25 racer, got the win at Ausdeck Patios and Roofing Archerfield Speedway in Brisbane, in front of a massive crowd at an event sponsored by his good friend Brent Kratzmann and on a night when his own almost six-year old son sang the National Anthem at the beginning of the night. It was a near perfect weekend for Scheuerle and the entire Ausdeck team, with Scheuerle taking the lead of the main race at around the half way point before racing his way into the history books. 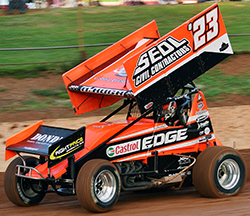 It is only the second time a Queenslander has won an Australian Sprintcar Title, with the only other Queenslander on the winners list being Todd Wanless back in 1996. Scheuerle was exquisite on track, less conservative than when he has series points on the line, and the always immaculately presented Q25 racer was set up beautifully thanks to crew chief Justin White and the Ausdeck Racing crew. James McFadden managed to hang on to finish second in the main race despite a damaged front wing, while Jamie Veal finished third to round out the podium. David Murcott crossed the line in fourth, a solid drive from eleventh on the grid, while Ian Madsen completed the top five. 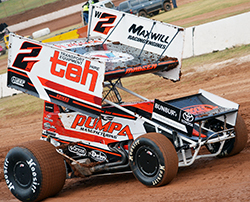 The BK Trading Australia Australian Sprintcar Title kicked off at Ausdeck Patios and Roofing last night with a MASSIVE night of Sprintcar racing, culminating in a thrilling twenty-five lap Preliminary A-Main. Robbie Farr withstood several challenges over the course of the feature event to stand atop the podium after the chequered flag flew, with Brooke Tatnell, who was elevated to second after Jamie Veal, James McFadden and Kerry Madsen were all involved in incidents that ruled them out of contention last night, challenging for control in the final stages of the race. Tatnell even briefly took the lead but Farr fired straight back, refusing to surrender and went on to take the win with Tatnell in second and Steven Lines a solid third. Andrew Scheuerle ended up the best of the locals last night, crossing the line in fourth with Ian Madsen rounding out the top five. With seven laps to run Jamie Veal and James McFadden came together in turn one, while negotiating over third, with both Danny Reidy and Luke Oldfield unable to avoid becoming involved in the incident. Veal and Reidy were unable to continue the race while McFadden and Oldfield restarted from the rear of the field. Lachlan McHugh was running well inside the top five when a drive line failure prematurely ended his race just five laps from home. Kerry Madsen was attempting a spectacular outside run around Robbie Farr for the race lead with six laps to run when contact between the pair left Madsen with front end damage and out of the race. Kerry Madsen got the win in the Prelude to the Championship at Ausdeck Patios and Roofing Archerfield Speedway last night, masterfully taking the lead from Jamie Veal around two thirds of the way in. Jamie Veal crossed the line in second but it was the drive by Gold Coast based young gun Lachlan McHugh that stole the show. McHugh had started the B-Main in position three, but was forced rear of the field after crew worked on his car during a stoppage early in the race. McHugh charged through the B-Main field to snare second, started the A-Main from position sixteen and proceeded to weave his way through the field, eventually displacing Andrew Scheuerle from third and closing in on Veal. McHugh crossed the line third, with Andrew Scheuerle and Jordyn Brazier rounding out the top five. 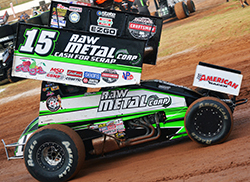 Last Night, for a special Wednesday night show, twenty-nine Sprintcars rolled into Ausdeck Patios and Roofing Archerfield Speedway for Round Seven of World Series Sprintcars, and the last appearance of Donny Schatz at the venue this season. And what a night of racing it was! On one of the best tracks we have seen at Archerfield this festive season the night culminated in a thrilling thirty-five-lap A-Main, with a four-way battle for the lead and a captivating challenge for the lead in the final few laps of the race. Donny Schatz had control but Jamie Veal challenged hard, getting his nose in front on the final lap while in heavy lapped traffic. Schatz found some extra momentum as they exited the final corner of the race, racing back around the high side of Veal and drag racing him across the line. Donny Schatz got the win, just 0.280 seconds ahead of Jamie Veal, while Queenslander Luke Oldfield managed to get third after an epic battle with James McFadden early in the race. Kerry Madsen finished a solid fourth while Peter Lack advanced from ninth to fifth by the fall of the chequered flag. Lachlan McHugh again won the Hard Charger Award for his efforts, having made his way to ninth after once again transferring from the B-Main, while James McFadden exited the race, while running in third, with only four laps to run after suffering front end damage as he made his way through lapped traffic. Last night Ausdeck Patios and Roofing Archerfield Speedway played host to the final night of competition in the Titan Garages Australian Sprintcar Open, which also doubled as Round 6 of QSS World Series Sprintcars. 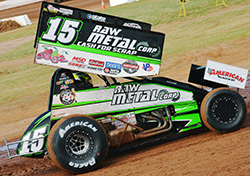 The two night affair culminated in a thrilling 50-lap A-Main and while eighteen of the twenty starters finished the event, which ran the first forty-eight-laps without a stoppage, it was once again Donny Schatz who collected the win, adding another tally to the list of Australian Open events he has won. 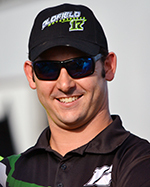 Logan Schuchart initially secured the lead and went on to lead most of the first half the race, surrendering the lead to Schatz in lapped traffic just before the half-way point of the race. Schuchart went on to finish second, while Kerry Madsen rounded out the podium ahead of Steven Lines and Jamie Veal. Queensland young gun Lachlan McHugh had a truly brilliant drive, crossing the line in sixth, after initially starting from position nine in the B-Main, earning a transfer and then charging through the A-Main field. McHugh was awarded the Hard Charger Award for his efforts.